Sure Apple's silverly aluminum Macs and peripherals have a unique charm you can't argue look bad. But you could also argue they're just about as boring as a refrigerator once you let your imagination run wild. 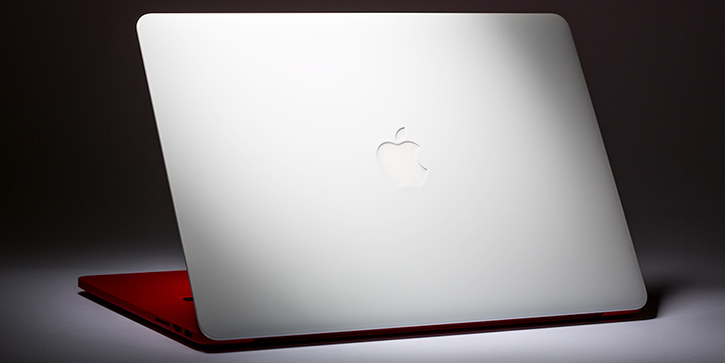 With no thanks to Apple, you can create your own one-of-a-kind MacBook and even Mac mini using a service like ColorWare, the only service we know of that let's you fully color and spec-customize any one of Apple's current MacBook lineup using professional techniques used in the auto industry involving a proprietary 2X clear coating that is impervious to UV ray damage, minor scratches and water. ColorWare was once a service that would let anyone send in their existing device whether it would be a portable Mac, a pair of headphones, an iPad or iPod - and you'd be able to get it back fully tricked out from the ground up with your custom paint job you've picked out before shipping in your device. These days ColorWare is doing things a little different. The company is acting as a reseller for the most popular gadgets while you've got the ability to pick out a product, customize the way it looks using a slew of color options with either glossy or matte finishes - and finally you're also able to upgrade any current generation Mac mini or MacBook with improved specs like you would thru Apple's online ordering system. From there, the wait for the process begins until the finished product finally arrives at your doorstep the way you truly wanted. ColorWare takes us behind the scenes for the first time where it reveals its intriguingly painstaking step by step procedure at how its laboratory mixed with a full fledged spray paint facility pimps out someone's MacBook Pro. Every little component is stripped away including left over glue until nothing but the bare aluminum unibody is left to ensure a clean and professional paint job similar to how cars are sprayed and detailed. Each device is disassembled and then put back together by a technician like it was done by iFixit. This way, ColorWare lets you pick out an individual color for just about every detail including the glass trackpad, lid hinge and Apple logo. Sadly, the keyboard is the only part on a Mac that isn't customizable most likely due to the complex laser etched keys. If you want to customize your keyboard without spending much, you can follow our guide. Great care is taken throughout every step of the process to ensure the highest level of quality from start to finish. Each ColorWare product is disassembled by hand from the original manufacturer. Once the product is disassembled, all parts are compartmentalized. Then the product is hand sprayed with a base coat. Once painted, It is baked at a low temperature to ensure the item dries thoroughly and evenly. Finally, the product is given an X2 coating that is also hand sprayed. This coating is a proprietary, scratch resistant, liquid plastic. The product is again baked, then polished and detailed and sent back to the production area for reassembly. Not only is the process durable and unique, but each step is completed at the ColorWare facility in Winona, Minnesota. Pretty cool to say the least. But it's going to cost you a hefty sum of money. A brand new custom stock 11-inch MacBook Air starts at $1,850 versus its normal retail price of $999, respectfully of course. Are you sitting down for this? A stock 15-inch Retina MacBook Pro starts at $3,270 versus its normal retail price of $2,199. ColorWare sells nearly every popular Apple gadget like a 16GB off contract iPhone 5 which will set you back $1,200. ColorWare's most recent addition to its arsenal includes the $350 Beats Pill portable speaker. It finally looks the part thanks to the power of customization.